it went over the top..if were looking at the same bullet "
"Look by his head. " Looks like it went over his head. Looks like it went over his head. " There's two going toward his head.There's one that clearly goes over his head and one under it.
" There's two going toward his head.There's one that clearly goes over his head and one under it. " It's a very vague showing of intangibility. Not very detailed. Sentry absorbs cosmic energy whereas silver surfer has a huge yet limited supply of it its a tough one as they are my two favorite characters but sentry takes this after a long fight. Guys, I know a lot of people don't use the sun check yet but I think we should. If we had to quantify Surfer's powers into stars (the size of our sun), how many would he have you think? World War Hulk also humiliated Surfer, but when Sentry attacked him it was more even.
" If we had to quantify Surfer's powers into stars (the size of our sun), how many would he have you think? " Proof that you never read the comic. WWH used a diversion to break the Surfer's obedience disk. Until that point, Hulk had agreed the Surfer would have killed him and his comrades on strength alone, if given one more opening. Hulk started pounding the Surfer once the Surfer had stopped fighting, and was expressing his gratitude for being free. The punches did not KO him either, because he freed Hulk and the other gladiators in the arena and lead them to safety. In the aftermath, he commented how much more weakened he was by merely remaining on Sakaar. And he still matched Hulk on strength alone. Do us all a favour and stop posting, please. Do us all a favour and stop posting, please. " Warbound had to pull Hulk off Surfer when Surfer was unresponsive, that is a KO in a cage fight when the ref pulls the guy off the fallen opponent. It was over, Hulk won, just accept it. I see, but Sentry is said to have a million supernovas (exploding suns) and now he has molecular manipulation. That may spell trouble if Surfer only has around one or two suns. The Surfer had stopped fighting. Accept that you lied once again, and move on. And no, KO = knock out. You tried to distort evidence yesterday when I clearly showed Thanos knocked out, you cannot distort it yet again, because the Surfer freed Hulk and his comrades immediately afterwards. Had he been KOed he couldn't/wouldn't have. It's perfectly simple, pup. Just accept it, and stop wasting my time. I think a comic book writer would likely use our sun as a point of power reference because he limited data, by comparison, on stars from other solar systems. I have grown weary of the entire "sun check" thing. It was funny at first, but not anymore. The Surfer had stopped fighting. Accept that you lied once again, and move on. And no, KO = knock out. You tried to distort evidence yesterday when I clearly showed Thanos knocked out, you cannot distort it yet again, because the Surfer freed Hulk and his comrades immediately afterwards. Had he been KOed he couldn't/wouldn't have. It's perfectly simple, pup. Just accept it, and stop wasting my time. " He was KOed and hurt because Warbound had to pull Hulk off of him and Surfer was laying there unresponsive. Just because he woke up doesnt mean he wasnt out. Sometimes a KO only lasts a minute, sometimes a couple seconds. Show the whole fight if you want to debate it, but Hulk did put him down when I read it. You make a good point, but it is possible he also has access to different types of suns. I wouldnt count out that the void has some variety. It could have given Sentry many types of stars at his disposal. Plus every time he uses a star it is probably burning out the one he is drawing power from. If Sentry was literally using our sun then he might kill the Earth, so I think he draws on them from other solar systems/galaxies. He was KOed and hurt because Warbound had to pull Hulk off of him and Surfer was laying there unresponsive. Just because he woke up doesnt mean he wasnt out. Sometimes a KO only lasts a minute, sometimes a couple seconds. Show the whole fight if you want to debate it, but Hulk did put him down when I read it. " Perhaps you should think about this before you post anything on Thanos again. Question - since when do we take cues from UFC on what constitutes a knock out? Did Dana White buy Marvel? Was he on the writing staff at the time?
" He was KOed and hurt because Warbound had to pull Hulk off of him and Surfer was laying there unresponsive. Just because he woke up doesnt mean he wasnt out. Sometimes a KO only lasts a minute, sometimes a couple seconds. Show the whole fight if you want to debate it, but Hulk did put him down when I read it. " I don't want to debate it, because it is something evident. I'm not going to teach you how to read comics, sorry. You can't have it both ways - yesterday you said Thanos was lying with his face on the ground thinking his strategy, now you say the Surfer was KOed because he was unresponsive to the Hulk hitting him? The Surfer had stopped fighting once he thanked Hulk, and later on he was lying hurt, but not knocked out. Why is that so difficult to accept? And at no case, did Hulk humiliate him as you posted earlier, because the damage was caused after the Surfer had no wish to fight further (it was superficial anyway, seeing that the Surfer was alright a few pages later, and had completely recuperated when he was seen talking to the Hulk before leaving Sakaar)- that's a suckerpunch, not humiliation. And you convenienetly failed to mention that the Surfer had no access to the power cosmic during that fight, and was relying solely on his physical abilities. At any case, I have no interest to debate with you further, but exaggerated, vaguely defined posts are bound to elicit a response. "Question - since when do we take cues from UFC on what constitutes a knock out? Did Dana White buy Marvel? Was he on the writing staff at the time? " It only applies in the mind of one person here.
" Question - since when do we take cues from UFC on what constitutes a knock out? Did Dana White buy Marvel? Was he on the writing staff at the time? " Hulk didn't even fight Surfer, he fought a guy called "Silver Savage"
Because everytime the Hulk and Surfer fought the Surfer would utterly humiliate Hulk, he would take Hulk's best shots, the Surfer would sometimes even beat the Hulk back with pimp smacks, start lecturing Hulk or maybe even act like his therapist and at the same time Hulk would be getting seriously owned. The writers found no concievable way Hulk would actually win against Surfer so they completely depowered Surfer. No flight, no speed, no energy attacks, no telepathy. surfer would total sentry to m any powers for him to contend with.
" surfer would total sentry to m any powers for him to contend with. " Don't talk about marvel.s second fabio OK!K!K! Sentry puts Silver Surfer in the Walls of Jericho.
" Not a single one of those scans show anything that proves Sentry loses. " This make sense, Sentry wins "
" SS is overrated. " idk, this tough cause surfer could disintegrate sentry, but sentry would just reform. then surfer would do the same thing, but so would sentry, & so on. so it would probably last forever. Depends on who is writing the comic. If its the same writer that had Sentry ripe the God of War in half like paper ill go Sentry but any normal day.....Im going with Surfer. Only because Surfer owns Hulk....Hulk beat Sentry. Surfer can drain Sentrys powers but not depower him. I dunno. I can see Sentry taking Surfer down but my gut is saying Surfer takes this 1. Based on the poor writing we've seen involing the Sentry/Void, the surfer wins. Although said to have an potentailly unlimited power set, Sentry exhausted his energy while fighting WWH in a poorly written battle between th e two. And in the Seige ending, a full powered Void was turned back into Robert Reynolds after being hit by a shield helicarrier. Thor killed him with a lightning attack. 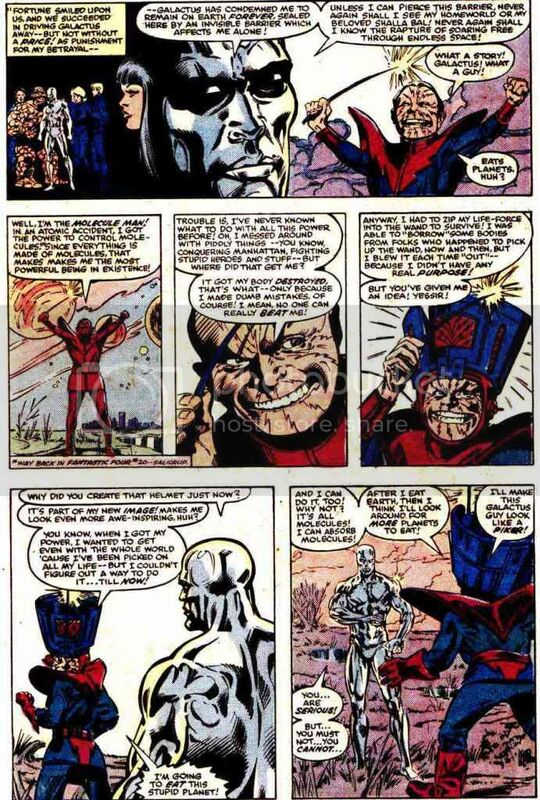 So based on the poor & crap writing of a being said to have stalmated Galactus, he seems rather weak. So based on actual feats & not hyperbole, The Surfer wins. He has so many ways to win. If a shield helicarrier will trigger a transformation from Void to Reynolds, then he has no chance vs the Surfer as his energy blast can destroy a planet. He can easily absorb the energy that fuels the Sentry/vOID. Sentry can't just blow up Surfer or manipulate his molecules because Surfer has complete control of his structure. Based on all we've seen, this isn't really a fair battle. "@The Mjolnir Wielder: spiderman has too many webs in his brains than "
So you decided to bump a year-old thread just to post that?
" @The Mjolnir Wielder: spiderman has too many webs in his brains than "
I wouldn't say that. He has a really high IQ. I think it might be possible that Sentry caused him to remember that incorrectly. Surfer stomps Sentry/Void any day. the sentry/void was reverted back to a human by a sheild heli carrier impact (poor writing for a being said to have stalmated galactus), an attack that the surfer would've ignored. Surfer has easily beaten more powerful beings then the sentry/void. The surfer has enough power to obliterate a planet & if a helicarrier explosion & thor's lightning attack was able hurt the sentry/void, then I don't see how this thread has lasted this long. "how strong is current silver surfer compared to terrax and is sentry voided or not "
Surfer has already demolished Terrax. His upgrade isn't necessary. so are u saying the surfer can beat the sentry? so are u saying the surfer can beat the sentry? " No, I'm saying he can beat Terrax without trouble seeing that he did it all the while earthbound. But since we are at it, yes, he can beat the Sentry. "the sentry/void was reverted back to a human by a sheild heli carrier impact (poor writing for a being said to have stalmated galactus), an attack that the surfer would've ignored. Surfer has easily beaten more powerful beings then the sentry/void. The surfer has enough power to obliterate a planet & if a helicarrier explosion & thor's lightning attack was able hurt the sentry/void, then I don't see how this thread has lasted this long. 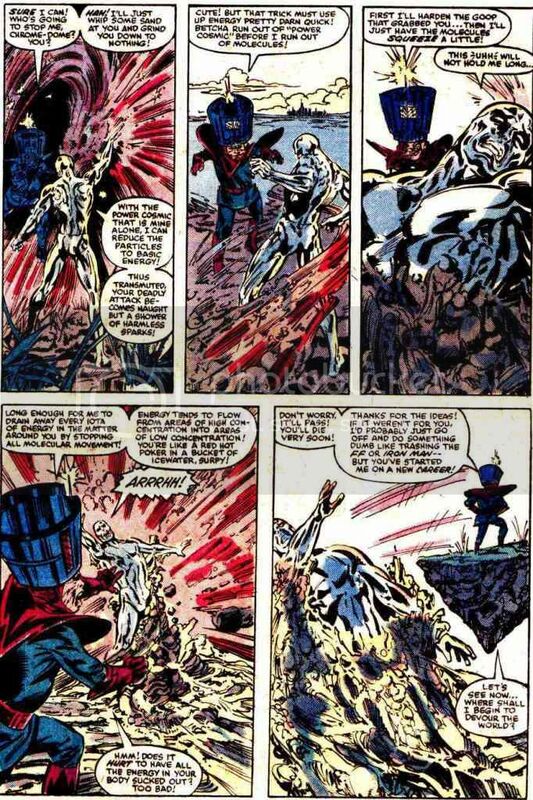 Silver Surfer 10/10 "
Either way Thor fried him with a magic thunder bolt as Voidy tenticle Sentry, Norrin should be capable of the same. "Depends on who is writing the comic. If its the same writer that had Sentry ripe the God of War in half like paper ill go Sentry but any normal day.....Im going with Surfer. Only because Surfer owns Hulk....Hulk beat Sentry. Surfer can drain Sentrys powers but not depower him. I dunno. I can see Sentry taking Surfer down but my gut is saying Surfer takes this 1. " Ares isn't anywhere close to the same durability as Norrin, much less strength and speed.